The thirteenth chapter in "32 Days of Movies", an audiovisual tour through 366 films. View "Chapter 13: Sixties Rising"
They called it a new wave. When a young boy skipped school and went for a spin, when party guests stood frozen as sundials in a chateau garden, when Anna Karina tossed her hair to and fro, it was hard to shake the image of a terrific tsunami crashing down upon an unsuspecting film world. There was the tremendous vitality of the images themselves: that whirling dervish seen through a dizzyingly subjective lens, those guests posed with gigantic shadows like something out of a Dali painting, the beautiful girl captured - or unable to be captured - by a handheld camera shooting casually on the street (contemporary audiences would have to wait for that particular image, as the film was banned; but there were dozens of others in the same spirit). Then there was something else, something beyond the visuals, as if the frame was a window through which one peered into a new state of ecstatic, thrilling consciousness. There was a certain je ne sais quoi in the air, and not just in France; all across Europe the promise of the late fifties was suddenly spreading its wings and soaring skyward. While waves and wings of flight come to mind, another natural image dominates today's clips - an image just as promising but also eerie, ambiguous, and sometimes ominous. The sun rises three times this morning: once after a night spent sleeping on a barren island, worrying about a missing friend; once as voices whisper through the wallpaper while the rest of the family sleeps soundly in another room; and once over the endless sands of the desert, beckoning the lonely adventurer into the wilderness to forge a new identity. Several other selections take place at dawn, while one includes a chilling reference to "a thousand suns." The dawn can be warm and enticing or cold and forbidding, it can give birth to dreams or kill them, but it is always pregnant with a vague power. The power to drive one mad or clarify one's existence, the power to wake one from a reverie or plunge one into a world more confusing and exciting than sleep. When did "the sixties" begin? Every medium, every cultural outpost has its answer. Perhaps it was Kennedy's election, inauguration, or assassination; it could have been the sit-ins down south or the Cuban Missile Crisis or the escalation of Vietnam; maybe Pop Art did it, or folk music, or the British Invasion. Was it the Mods? The Hippies? The Yippies? Did drugs do it? Perhaps it didn't really happen until the Summer of Love or May '68, only to end just as quickly and leave the ragged survivors wondering if they imagined it. Yet as far as movies are concerned, the answer is crystal-clear. In 1959, at least a half-dozen fresh, vital, wholly original films were shot. The sun rose, the wave rolled in, the flagpoles weaved and rattled in the mysterious night ... and nothing would ever be the same again. I have covered today's films here, here, and here. Today I added a page for "32 Days of Movies" called "Video Gallery" which will feature continually updated links to every chapter in the series. You can find it here, as well as through the tab atop the site, and the top icon on the sidebar. 60's were indeed a great time for cinema, which continued through the 70's too. Not just France, but many more countries imbibed this new wave into their cinema. 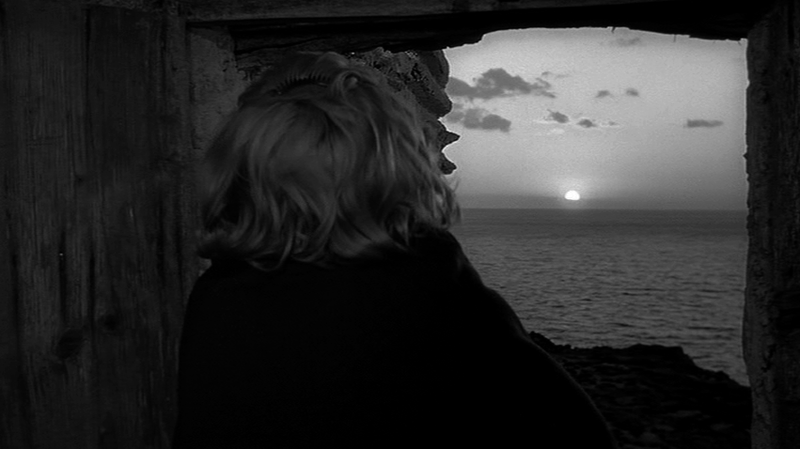 I've watched 5 of the films you've covered here - Truffaut's The 400 Blows, Godard's Breathless, Fellini's La Dolce Vita, Antonioni's L'Avventura, and Bergman's Through A Glass Darkly. You're right that the period continued in the 70s - I used to feel that Europe sort of "transferred" the baton onto America, but actually there are a ton of European classics I love from the 70s too. But there's something about that nascent sense of discovery to '59 - '66 that I just find irresistable, making it possibly my ground zero of film-love. All in all I would say the next seven chapters form one unit, with the first 4 the rising action, and the last 3 a sustained climax with a crescendo, a moody lull, and then a bang of a finish. I just finished the final chapter of the 60s last night, and had a blast adding a little treat at the end (while it started as a blast, by the end of the process it was kind of mind-numbing but it was fun to watch afterwards). The next 7 episodes, for sure, cover my idea of cinematic nirvana. Great post. Love the way you opened the piece. Sorta mysterious. Keep it up. Great blogging!